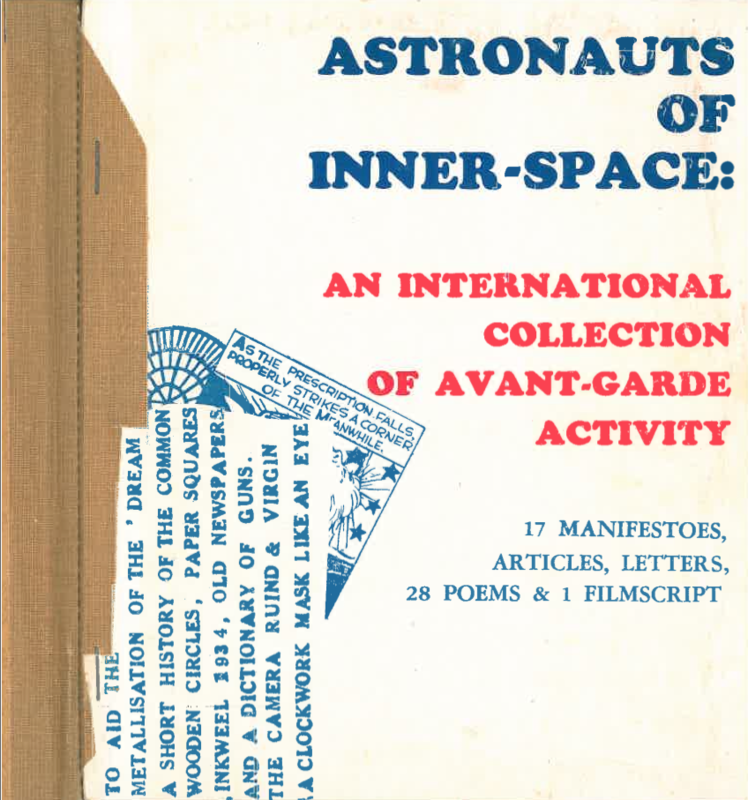 Recently I stumbled upon an odd but thrilling little publication from 1966 called Astronauts of Inner-Space: An International Collection of Avant-Garde Activity which includes – according to the front cover – 17 manifestoes, articles, letters, 28 poems and 1 filmscript. The collection is so astounding that I had to make a pdf of it – available here, if you’re interested. And why should you be interested? Because it documents a rare moment when media theorists such as Marshall McLuhan are not just influencing but are actively in dialogue with artists, painters, poets, filmmakers, from the avant-garde of the early 20th century to the mid-1960s. Look at the table of contents and you’ll see that McLuhan’s piece, “Culture and Technology,” is nestled among contributions by pioneers of Dada such as Rauol Hausmann to pioneers of computer generated poetry Max Bense and Margaret Masterman; it’s also included along with essays and poems by “typescape” poets Franz Mon and Dom Sylvester Houedard, work by cut-up master William Burroughs, and even the more bookbound Robert Creeley. In this single collection, we not only get a sense of McLuhan as engaged with poetics but we see the poets as writing thoroughly activist media poems. They are even activist in the sense that McLuhan was imagining when he wrote in his Astronauts of Inner-Space contribution that “…if politics is the art of the possible, its scope must now, in the electric age, include the shaping and programming of the entire sensory environment as a luminous work of art.” Politics as art and poetry; art and poetry as politics. Amazing! May I add the PDF here (another exploration of McLuhan &the avant-garde via Higgins): http://aphasic-letters.com/media/ ? McLuhan was absolutely visionary and a huge influence on my more recent writings. I’m super-psyched to read this stuff. Thanks a ton! I once had a book by Mc Luhan and Harley Parker about the inner space in art through out the centuries. He was a great synthesist. You might like this too, if you haven’t seen it: http://www.ubu.com/aspen/aspen4/index.html. Sorry added an e to your first name by accident when looking at loriemerson.net. Too much screen time will do that to the eyes and brain I guess. Apologies! Right! Just saw an intriguing talk a few weeks ago by Alex Nagel of NYU Fine Arts (http://www.nyu.edu/gsas/dept/fineart/faculty/nagel.htm) where he did a crazy wonderful reading of McLuhan as a medievalist in the sixties! Part of a larger project of his about what he calls the “medieval 60s.” Good stuff. Cage turned up often, as did various other avant-gardists. Check out Aspen Issue #3 too on Pop art. Similar stuff. Got to see one of the actual boxes once at the Andy Warhol Museum Archives. Fun online, but even more amazing in person. Nice to make contact. Please stay in touch.